. @JonathanLittle rivers a full house, but still has to exercise caution versus a splashy opponent. 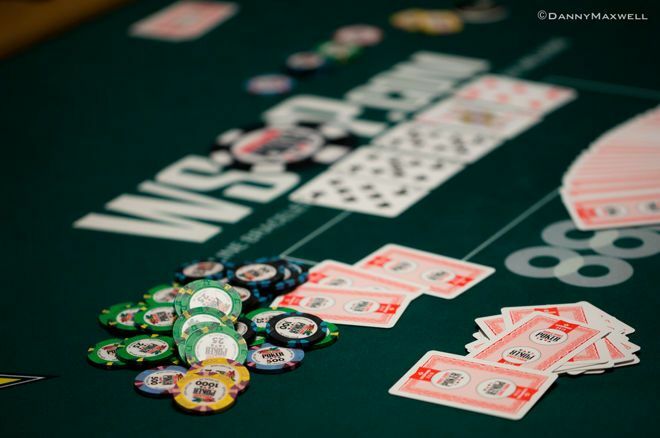 Tournament strategy: @JonathanLittle plays a multi-way pot in a WSOP Shootout event. We're returning today to that second table of a $1,500 no-limit hold'em "shootout" event from the World Series of Poker to discuss a multi-way hand in which I end up rivering a full house but don't necessarily feel all that great about getting more chips in the middle. The hand began with a tight-aggressive player min-raising from early position and the cutoff and button both calling. I was in the big blind with and a stack of about 40 big blinds to begin the hand. Given such great pot odds, I called as well, and the four of us saw the flop come . I checked with my top pair, and was glad to see it check all of the way around. The turn paired the board, coming . As I explain in the video below, this was a terrible card for me. It checked around to the loose, splashy player on the button who bet 5,000 (about one-third pot). Versus a bigger bet, I'd probably fold. But again the pot odds were hard to resist and I called. The other two players folded, then the river brought the , giving me a full house (jacks full of kings). I'll stop there and let you see what happened on the river, and also let you hear the reasoning for why I played it the way I did. As I say on the video, when we get to the river, I have to realize my opponent has played the hand exactly as he would if he had a jack, and also exactly as he would if he were bluffing. I have to check in order to minimize my loss if he has the jack, and to induce the bluff. It was an unfortunate spot for me, but I can't feel too badly about losing a small pot (and avoiding losing a bigger one).